Remember when the officials called 'No. 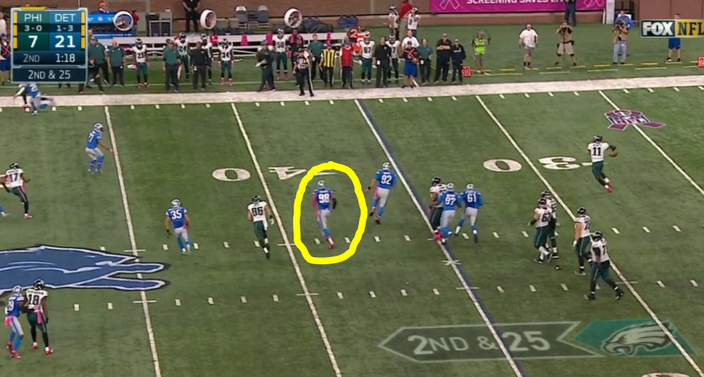 98' for being illegally downfield near the end of the second quarter of the Eagles-Lions game on Sunday, and then they just didn't enforce it, without making any sort of announcement on why not? Yeah, there was a good reason for that. 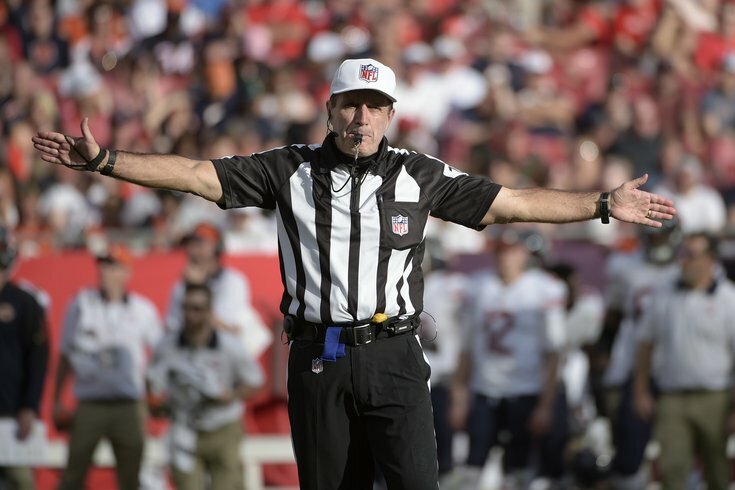 Referee Pete Morelli probably didn't want to have to explain, "We thought one of the guys on the blue team... number 98... and not any of the other players on the blue team... just number 98... was illegally downfield because we temporarily thought he played for the white team, which we now realize is incorrect after further discussion." You see, according to Justin Rogers of The Detroit News, "one of the officials forgot which team was on offense and threw the flag on Lions defensive end Devin Taylor, No. 98." Officiating is hard. In fairness, if Taylor was wearing a white jersey and if he played for the Eagles, he was indeed illegally downfield, as the officials called. 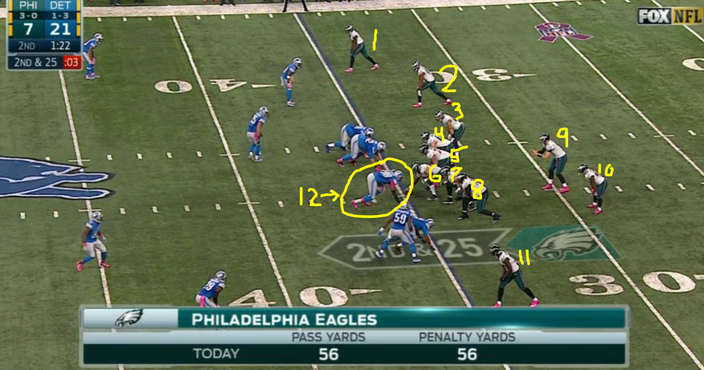 As you can see, the line of scrimmage is the 35-yard line, and Taylor is at the 39-yard line as Carson Wentz is about to throw. So that would have been a good call if Taylor played for the Eagles. However, while the officials would have gotten the call right that Taylor was illegally downfield if he played for the Eagles, they missed a myriad of other infractions, which we'll list below. Technically, Taylor may have been an eligible receiver, which would have allowed him to go downfield, but because 98 is an ineligible number, he would have had to have reported as eligible to the referee before the play. Because (we assume) he did not, Taylor could have been called for an illegal substitution. 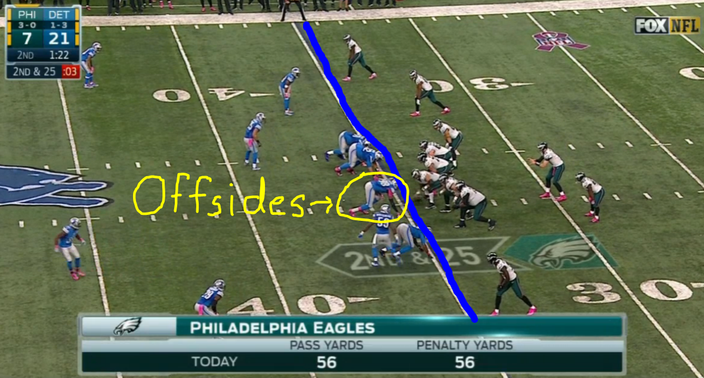 He is very clearly offsides. "Each player on a given team must wear the same colors on his uniform as all other players on his team in the same game. Home clubs shall choose their jersey color (either white or official team color), and visiting clubs must wear the opposite. For preseason, regular season, or postseason games, the two competing teams may wear jerseys in their official colors (non-white), provided the Commissioner determines that such colors are of sufficient contrast." Taylor wore blue, as the above screenshots show. The Eagles, however, wear white. While the rule book does not specify what the penalty is on the field for wearing the wrong jersey color, it should stand to reason that Taylor is likely to receive a fine.